Eastbay is restocking some of the most coveted kicks released in the last 6 months. Almost every Air Jordan Retro released in the last year is getting restocked. This is likely to be the single biggest Jordan Retro Restock of 2014. 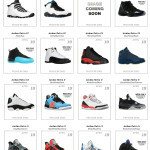 Just like the FinishLine.com Jordan restock coming saturday, this is another confirmed restock, so it will be happening. If you’ve missed out on the Retro 1 Bred, Gamma 11, Bred 13, Bel-Air 5 Fear 4 and more, now is your chance. Get the links to cop them below. UPDATE** Eastbay has stated the restock will be mainly size 15 and up. Altho some may restock in smaller sizes, there won’t be many pair the average person could wear. Don’t feel like waiting until Saturday? Here’s out list of Retro Jordans you didn’t know are still in stock. More links will be made available as we get them. Check back for updates.